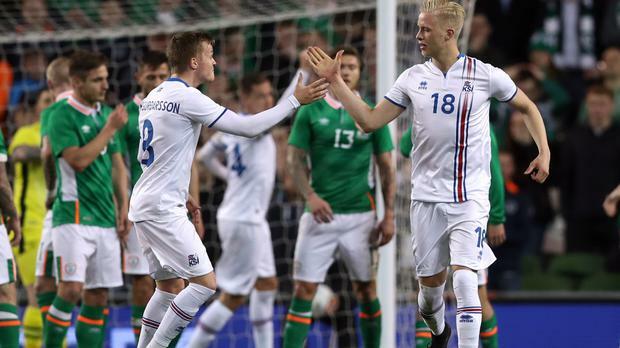 Hordur Magnusson's first-half free-kick was enough to hand Iceland a friendly victory over the Republic of Ireland as Martin O'Neill's under-studies learned just how far they have to go. The Bristol City full-back curled home a 21st-minute free-kick to secure a 1-0 win at the Aviva Stadium on a night when Ireland only found their feet after the break and even then, did not create enough to stand a chance of clawing back the deficit. O'Neill gave senior debuts to Brentford defender John Egan and Aston Villa midfielder Conor Hourihane from the start and Preston pair Andy Boyle and Daryl Horgan as substitutes as he experimented with the depth of a severely-depleted squad. What he discovered was that at this point, there are few men who are yet ready to step into the shoes of his big guns, perhaps with the notable exception of midfielder Callum O'Dowda, who once again made an encouraging contribution as a second-half substitute. While the game was more about blooding new faces, he will have been disappointed to have suffered a first defeat at the Aviva Stadium in three years, albeit one at the hands of a side which once again demonstrated the kind of organisation which served it so well at last summer's Euro 2016 finals. With skipper Seamus Coleman's injury still casting a shadow over the Ireland camp, O'Neill was as good as his word as he handed his fringe players a chance to prove themselves on the international stage with only Jeff Hendrick and James McClean retaining their places from Friday's goalless draw with Wales. In all, he made nine chances to the side which started against Wales with opposite number Heimir Hallgrimsson retaining only four of the men who walked out for Friday night's 2-1 qualifier victory in Kosovo. However, it was Hallgrimsson who would have been the happier by far at the break with a team featuring only four of the men who put paid to England in France last summer enjoying much the better of the opening 45 minutes. With skipper Aron Gunnarsson and Olafur Skulason holding sway in the middle of the field, Aron Sigurdarson was able to link with frontmen Kjartan Finnbogason and Jon Dadi Bodvarsson to good effect. The front two proved a real handful for Egan - who was left bloodied after being caught by a flying elbow early on - and Alex Pearce, and it was Egan's foul on the combative Finnbogason, for which he was booked, which handed Magnusson his chance. His curling left-footed free-kick evaded the Irish wall and goalkeeper Keiren Westwood to hand the visitors a 21st-minute lead it was difficult to argue they did not deserve. Finnbogason whistled a skidding 33rd-minute drive just wide as Iceland attacked in waves with Hourihane and Jeff Hendrick fighting a losing battle in central midfield. Ireland's only meaningful response was a glancing Kevin Doyle header from a 36th-minute McClean cross which flew well wide in a disappointing first half. The home side resumed in much more positive fashion and McClean, Aiden McGeady and Cyrus Christie had all sent crosses into the Iceland penalty area before Jonathan Hayes caused Magnusson all sorts of discomfort to win a 49th-minute corner, although one which ultimately produced nothing. Substitute Holmar Eyjolfsson had to make a 61st-minute block to deny Doyle after Hendrick had headed back a Hayes cross and O'Neill made his move, sending on Boyle and Horgan, as well as Stephen Gleeson and Eunan O'Kane with Shane Long and O'Dowda soon following. O'Dowda came as close as anyone to dragging the Republic back into the game when he slid past Eyjolfsson before unleashing a 76th-minute shot which defender Sverrir Ingason managed to block for a corner. Ireland pinned Iceland back as they fought desperately for an equaliser, but they were able to fashion only half-chances as the clock ticked down with redemption remaining tantalisingly out of their grasp.